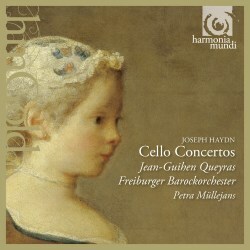 During the course of writing a number of Haydn cello concerto reviews earlier in the year, I read some very positive comments about this Harmonia Mundi recording. It has been available in the last couple of years as a HM Gold reissue at reduced price; the original recording dates from 2004. I have also read one absolutely scathing review (not on our site), lambasting the performances for ideological excesses in the quest for historical accuracy. Loving the Haydn concertos as I do, I thought I should see for myself, especially since I had heard Queyras in Romantic concertos, and had been hugely impressed. From the opening bars of the C major concerto, I had a good feeling. This was not excessive HIP; speeds were well within the normal range, the vibrato-less strings of which I am not a fan and were one of the main complaints in the critical review, floated elegantly, sounding warmer than I had expected. Nor did the natural horns did bray, another personal bugbear. Granted, you are not going to mistake this for Jacqueline du Pré and the LSO, but few, if any, performances of these works in the last two decades have gone anywhere near the impassioned Romanticism of those old recordings. The star of those earlier reviewed recordings was the one by Daniel Müller-Schott and the Australian Chamber Orchestra (Orfeo – review). Queyras and the Freiburgers have not supplanted that from the top rank of my affections, but I have certainly enjoyed their work, and will revisit it often. The Monn, in its Schoenberg arrangement — does it exist in its original form, I wonder — is an interesting filler, more so than the unsuccessful Beethoven violin Romances (arranged for cello) that are on the Orfeo disc. Its title implies that it is a double concerto, but the harpsichord essentially fills the continuo role. The recording is immediate, but that does lead to some extraneous noises from the performers. I can’t comment on the booklet notes, as they are not provided with the download. I certainly find myself on the side of the argument that says this is a very fine release, though not enough to change my favourites.